The future we see in Real Steel is one where human boxers and professional fighters have been replaced by robots. Charlie Kenton (Hugh Jackman) is an ex-boxer who is having less than good luck when it comes to the robots he controls. Enter Charlie’s estranged son Max (Dakota Goyo) and it is not long before Max’s enthusiasm and determination rub off on his old man, and Atom – an old sparring robot they train up – is winning his fights. Real Steel is based on a short story by Richard Matheson of I am Legend fame, and although it is incredibly formulaic, it actually ticks most of the boxes. We can all guess where this tale of the underdog is going to go, and we are almost always right, but this is made up for by the casting and the robots. Hugh Jackman is just the right amount of cocky and arrogant throughout the whole film, and it is only when Max stands up to his father that some of the wind is knocked out of Charlie’s sails. Dakota Goyo is not the most endearing child in the world, but he is by no means as annoying as some of his namesakes. Evangeline Lilly has very little to do but look pretty and the same goes for Hope Davis who just has to be frosty and mean to Charlie – a ne’er do well who has us rooting for him very early on – but both women manage to do this convincingly. The robots are what make the film that little bit special. The film feels a little bit like that episode of Futurama where Bender joined the Ultimate Robot Fighting League, but without AI being fostered onto the robots. There are some very cool and fearsome robots in the film – in particular, Zeus – so of course we are rooting for Atom; the underdog. Atom wins the audience’s hearts through his Shadow Function, which allows him to imitate the actions of the humans in his eye line. This, coupled with his glowing blue eyes and comparatively tiny body, make Atom that little bit more human and that little bit more loveable. So what makes Real Steel more fun than the recent Transformers movies? Well, humans are needed in this world in order to make the robots work, the robots are not aliens, and if Atom loses a fight it is not the end of the world as we know it – the story is much smaller and more relatable than that – it will be the end of Max’s world, and we are completely on his side. The fight scenes are far better than the incomprehensible ones in Transformers; the action is slower so the audience is given the chance to actually see what is happening, rather than just seeing girders and bolts whizzing across the screen and ultimately, we actually care what is going to happen. There are times when the movie seems to drag it’s heels, but the climactic fight scene is worth it, as are most of the others. Real Steel is the movie that Transformers wishes it was. These are real characters that the audience cannot help but care about, the outcome has an impact on real people and not just a robot that looks like a truck. The story, while it is nothing new, is well rounded and engaging enough to draw the viewer in while being both big enough and small enough to matter. 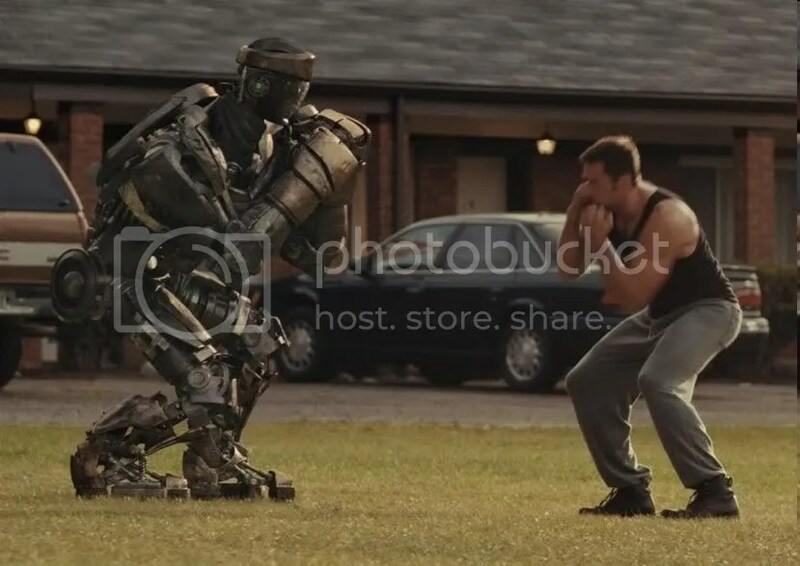 In all, Real Steel is a great watch, I mean, who doesn’t want to see robots beating the heck out of each other?